Karnataka Governor T.N. Chaturvedi today asked Chief Minister N. Dharam Singh to prove his majority on the floor of the House on January 27. Calling the period reasonable, the Governor warded off criticism of the decision by the BJP by stating that there were precedents of two weeks, one month and two months being given for the same purpose. Is Punjab doing enough to attract potential investors? 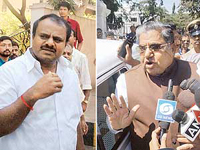 The Congress high command has instructed its Karnataka leaders to try for a patch-up with the Janata Dal (Secular) even as the Bharatiya Janata Party has demanded the immediate convening of the state Assembly for trial of strength and Left parties have decried efforts to topple the state government. Nation page: Coup or planned enthronement? The visiting US Under Secretary of State for Political Affairs R. Nicholas Burns today told the Government of India that US President George W. Bush would visit India in early March and the exact dates would be formally announced by the White House in due course. 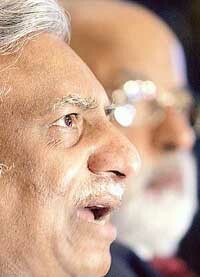 NATION: Coup or planned enthronement? Mr Justice V.K. Bali, Judge of the Rajasthan High Court, has been cleared for appointment as Chief Justice of the Kerala High Court. According to informed sources, he is expected to take oath on January 22. It was a day of disaster for Sania Mirza who could not justify her billing and after losing in straight sets to a lower ranked Michaella Krajicek in the singles, the Indian ace bit dust in the doubles event as well in the Australian Open here today. Recruitment of drivers or human trafficking? Dubai-based company, Drake and Scull International, had been forged to attract the gullible candidates. The self-styled khap panchayatis are at it again, this time expelling two families from their respective villages for daring to marry their children despite the panchayat’s objections. The decision was taken after a marathon meeting of the Sheoran 25 panchayat held at Nagla village today. The panchayat ordered the families to leave their villages within 15 days, besides imposing a token fine of one “dhela”. The education of a girl would play a major role in containing population because she get a mind of her own and would cease to be a reproductive machine.